Each morning, I take a long walk along the Maine coast, returning home through a neighborhood of grand vintage coastal homes. I feel as if I watch the changing of the seasons with each step. The ocean and the landscape surroundings look slightly different each day. Plants bud and blossom, birds return from the south, the sounds of the waves soften with the warm summer breezes. When season changes it can feel like I’m taking a different route each day. I observe changes in colors, foliage, and reflect on how it looked in days or months past. Here we are in May, a time of new beginnings. The grass is greening up, the leaves are budding, and little outdoor rooms are being set-up by homeowners. The outside is a magical, unpredictable space. When decorating, often people forget that the outside can be as exciting as the indoor spaces. Adding a sweet, rustic table, or building a seat into nature can create a perfect vantage to sit, and reflect on all the life around you. Today, I’m looking for ways to incorporate a reflecting spot in my garden “room”. 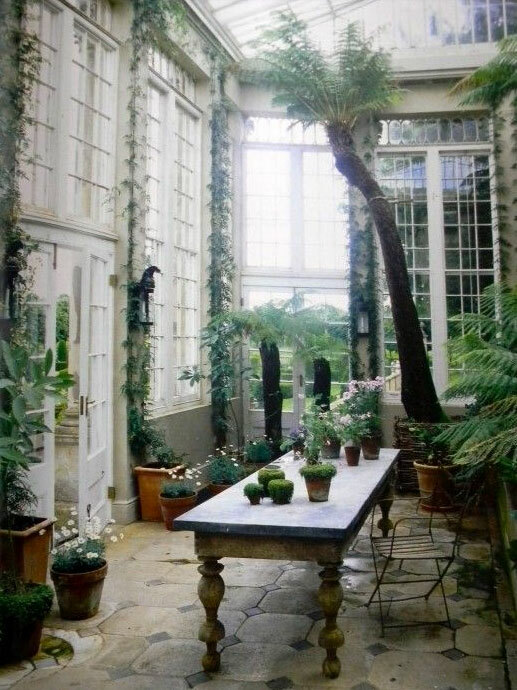 Adding a rustic farm table into a conservatory, serves as a perfect spot for small topiaries, and greenery. Gives reason to sit and enjoy the details of the garden. 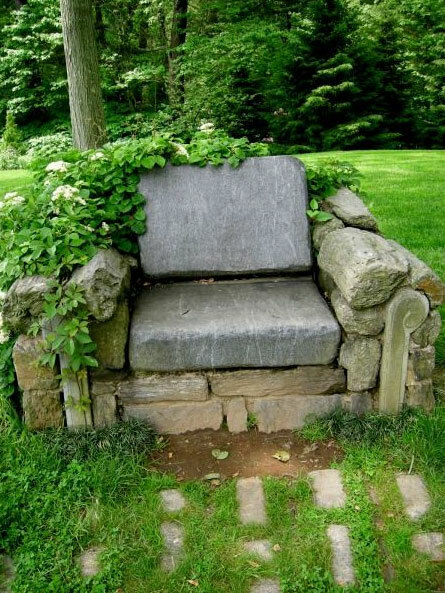 A stone chair carved out of nature. Take a seat on this rocky lounger made of cobblestones found on the property. Nestle a table and chairs centered on green space. 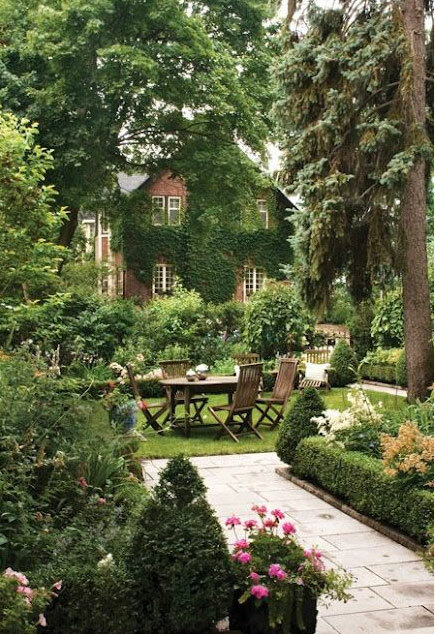 Create an outdoor room with purpose, functions in this otherwise small yard. 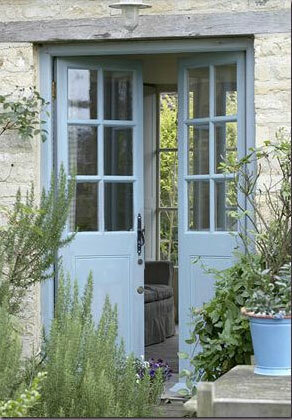 A door painted french blue becomes part of the garden design, bring color from the indoors outside. The color is repeated in the the robin’s egg ceramic pottery on the table top. If you’re short on outdoor space, incorporate tree cuttings in large glass water jugs and collected bottles. 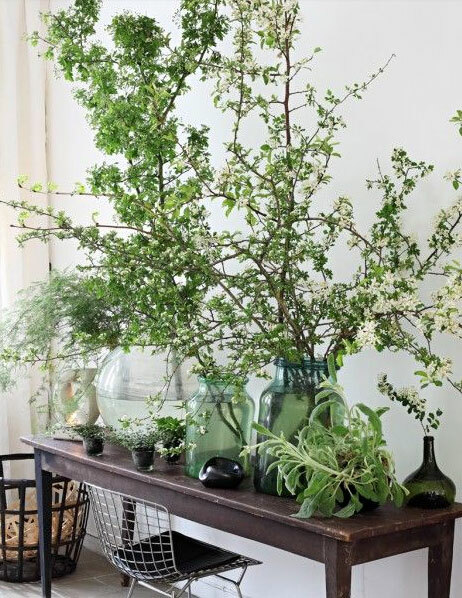 By grouping a mass of cuttings on a table, you can create a feeling of an outdoor garden inside.